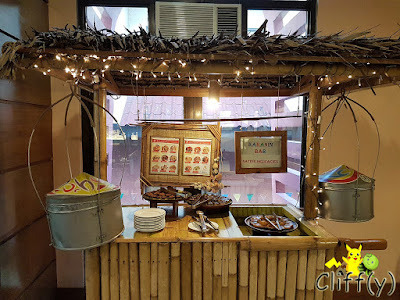 The Mabuhay Manor stands at the heart of Baclaran, which is said to be "a local shopping haven comparable to Bangkok’s Chatuchak and Hong Kong’s Mong Kok". My BFF and I decided to stay there for a night due to the free shuttle to SM Mall of Asia and the one-way airport transfer that's included in the room rate. 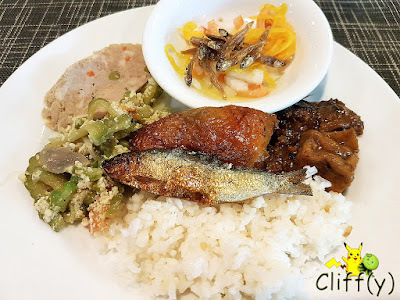 I had a plate of Filipino cuisine that actually felt home-cooked. In fact, I daresay the chicken and beancurd stew prepared that morning was better than the adobo served at Bistro Remedios. The tangy local salad with crispy anchovies, as well as the steamed meat loaf, was pretty delicious. Besides rice, I also had the thick noodle, which thickness was akin to that of udon (Japanese wheat-flour noodle). 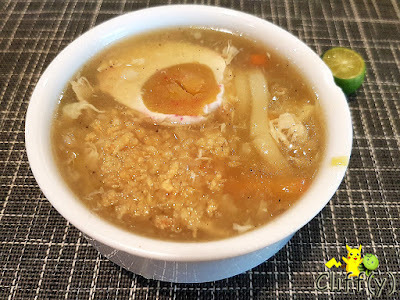 The soup was thick too, going well with a dash of calamansi juice. I was really happy to add a lot of fried garlic bits to make the dish more fragrant. The vegetables for the salad weren't too fresh, but acceptable. I mixed them with a few strips of uninspiring ham and a slice of cheese. 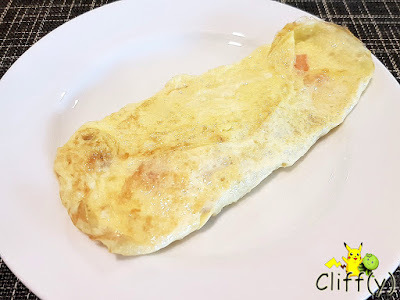 I've got nothing much to say about the omelette too. While it wasn't bad, it was too thin and not exactly moist. I guess they didn't do so well with the Western items. 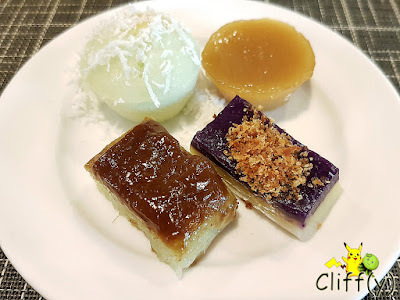 Traditional Filipino cakes were offered for dessert, reminiscent of Indonesian and Malay sweets. Of the four items, I enjoyed the yam rice flour cake the most, which was topped with toasted grated coconuts. 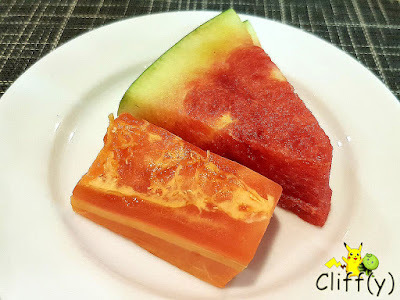 The watermelon slices were pretty sweet with a high water content. On the other hand, the papaya slices could be juicier. 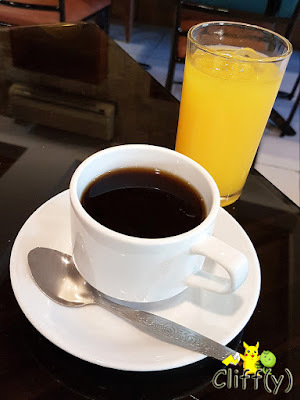 The coffee wasn't particularly memorable, but the orange cordial drink was pretty concentrated, and thus sweet. 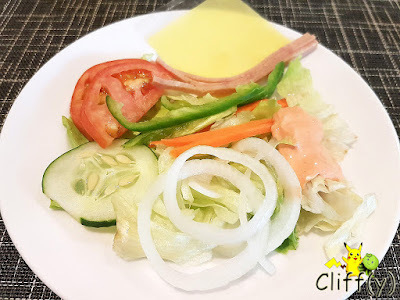 While there were hits and misses, I did enjoy the homely local flavours, just like many other guests who've left comments online on their satisfaction with the breakfast buffet. 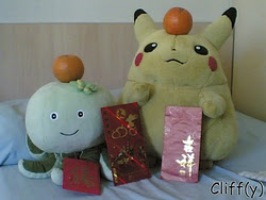 Pika's advice: I don't think you'll be disappointed ordering this. Do note that the chili soy sauce can be really spicy, as it was the case when I was there. *No separate price given as buffet breakfast is included in the room price.